Our kitchen’s designs must be such unique and versatile that the one who cooks the food there remain refreshed all throughout. While cooking isn’t a monotonic job, the design of the kitchen can indeed make it a monotonous experience for the cooks if it is not built in a proper fashion. Also, the protecting feature that the kitchen walls shell out must also be taken care of well, otherwise the eradication of the wall decor may lead to many more damages in the future than expected. It is quite normal that people put kitchen tiles on the wall to provide an attracting outlook and also prevent the wall from being damaged by the regular inflow of cooking smoke (when you don’t have a chimney). With the ongoing market trends, keeping up with the kitchen wall tiles design ideas is also a big deal for the homeowners. Skip the 3”x6” sized tiles– earlier the smaller sizes of the wall tiles were favoured by people. But in this modern era, the larger the size of the tiles, the best the outlook of the kitchen. People no longer opt for the 3”x6” wall tiles size, instead of the standard sizes nowadays have become confined within the ranges of 4”x8”. Sometimes it can even range up to a 4”x12” sized tile also, given the area of the kitchen is larger than normal. Metallic and mirrored tiles– these two tiles finishing are bound to make you fall for the design every day when you look at the kitchen. They shell out an overall classy and aesthetic look with their subtle and unique features. The mirrored tiles are a kind of reflective and glossy, more so when natural light falls on them, whereas the metallic tiles are less glossy and shell out a real metallic look to the kitchen walls. When you extend the entire backsplash with these kinds of tiles, it surely can give out a perfect look to your kitchen. Patterns are cool enough– when you include patterns in designing your kitchen wall, there is no need to talk about the visible outlook it shells out after the installation. The décor become completer with more and more patterns; in short, you can opt for pattern stuffing into your kitchen wall to give it an outlook to admire by the onlookers. Also, the likes of graphic prints, bold coloured patterns and large-sized patterns are also in trends and most likely picked up by people with modern choices in home décor. Mix and match colours– the rich and vibrant colours can never go out of fashion in terms of anything related to home décor. And so, choosing bold coloured tiles for the kitchen goes well with all types of kitchen designs. Alternative materials– using alternative materials for the kitchen tiles design purpose is welcomed by all these days which includes stainless steel, aluminium, ceramic tile installers, copper, zinc, etc. other than the regular metal sheet materials. Infusing these materials brings about a different finishing of the wall tiles décor. Brick tiles– these kinds of tiles designs must be common but they possess an aesthetic and traditional approach as long as the kitchen tiles designs are concerned. 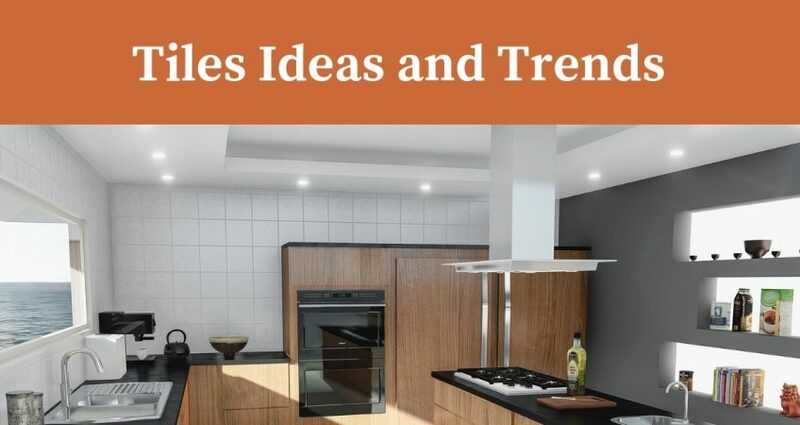 It does not mean they lack in the modernization but they infuse both the qualities simultaneously to give your kitchen a blend of modernization and tradition altogether. You can also choose the brick colouration according to your will for bettering the design of the kitchen to a greater extent. Build the backsplash up to the ceiling height– gone are the days when putting kitchen tiles on half the wall was mandatory in almost every household. Nowadays, pulling the tiles above the normal mark and up to the ceiling is preferred by most homeowners. The ceiling height of the backsplashes make for some classic statement as long as the décor of the kitchen wall is concerned. The kitchen cabinets or the furnaces present in the kitchen looks appealing only when it is customized with the kitchen wall designs. Be it the brick slips or the marble finishing, the kitchen wall designs must be unique in a way that it shells out a visibly good approach to the dwellers of the house. The kitchen tile ideas mentioned here in this article are some of the trendy designs that are being loved by people across the UK and so these are also in high demand. Also, you can get these designs at affordable prices, which means you don’t have to worry much about the cost of remodelling or refurbishing your kitchen- the most popular cornet in every household.